"Trek Himalaya Tours" is a registered Indian company based in the Garhwal region of India with an overseas office in Vancouver, British Columbia, Canada. In Canada, we're known as "Trek India Himalaya Tours" and since 1989, we have been providing specialized tours and treks into the Indian Himalaya region. As noted in the current edition of Lonely Planet's "India GuideBook", we have become a respected trek operator with local roots and expertise. Our focus has always been one of environmental and cultural sensitivity, while providing quality-value service with a personal touch. We can also customize your group itinerary (with enough advance notice) and offer both escorted tours from Canada (including other options) or from our head office in India. 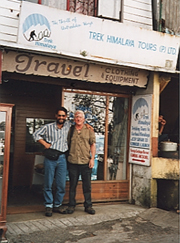 Bill Marion operates the Trek India Himalaya Tours Office in Vancouver, British Columbia, Canada, and has a long experience in organizing treks and personally leading groups in the Garhwal region of India now recently named Uttaranchal. Bill has a high regard for Indian (Hindu and Buddhist) religion and philosophy and a special relationship with two swamis, one a modern sage of the Himalayas; the other a renown Siddha Master from South India. Phyllis Victory, a healer and group facilitator in Canada, the USA and Mexico led a group with Bill to the Source of the Ganges in 1996. This year she is collaborating again with Bill to return to India and facilitate several groups. Rasik Shah, also a resident of Vancouver, has extensive knowledge of Indian society and culture, speaks several Indian languages, and has led many a group on tours of India, including Ladakh. He has had a long association with Bill Marion and Neelu Badoni and has collaborated with them in the past. Neelu Badoni is the director of Trek Himalaya in Mussoorie, India and is an experienced trek leader. He is a native of Garhwal, speaks the local dialect and knows his way around the mountains having grown up there. He is well known by the people of the region and accepted as one of them. With him around, doors (not always open to others) open up quickly and all his friends receive a warm welcome. He is well educated and sophisticated in his awareness of and ability to cope with the problems faced by Western travelers in India. All tours are personally escorted and Trek Himalaya has been providing a quality support team to many people around the world including Europe, North & South America and Australia and New Zealand since 1989. "Lonely Planet", a well- established international travel publication has included our mention in their 'travel survival kit' India books. Our endeavor is to let you experience your journey as a true pilgrimage. We take groups limited to small numbers and arrange things so as to make you feel comfortable and among friends. We avoid commercial-orientated accommodations, tourist "city tours" and so forth. You are treated as a personal guest in an atmosphere of immersion in your new milieu. Wherever possible, we arrange to let you meet our friends and acquaintances, who maybe writers, sadhus, swamis, business people, families or just ordinary folk.